Hudson Awning Company, Inc. began their history making sails for the tall ships that docked along the Hudson River way back in 1881. Today, they are a respected custom awning, canopy and shade structure provider for commercial, residential, retail, and other facilities. When they were asked to provide canopies for The Asbury Hotel, a hip new project on the Jersey Shore, they knew Herculite awning and canopy fabrics were up to the task. iStar, the developer on the project, hired Fields Development to manage construction on The Asbury Hotel. Fields Development turned to Hudson to create canopies for the building. The Asbury Hotel’s location and prospective clientele (trendy young professionals) created a unique set of challenges for Hudson Awning. 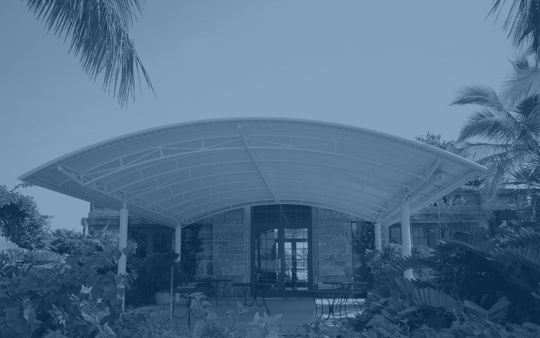 The building is located just one block from the ocean, so a canopy fabric that could stand up to salt, wind, and water in all four seasons was crucial. In addition, the fabric needed to be flame retardant in order to comply with IBC codes. Hudson Awning immediately knew the right material for the job — Herculite’s Coastline Plus. This fabric is made of a vinyl and polyester composite that is designed to stand up to the elements, and it’s colorfast and flame retardant. In addition, it can be heat-sealed rather than sewn, making it extra resistant to saltwater moisture. Coastline Plus also fulfilled all of the client’s design criteria. It comes in a wide variety of colors, including an eggshell shade that matched the designers’ vision for the hotel. In addition, its design avoids the shiny finish that is typically seen on vinyl awnings. “It's a very matte vinyl. It's not shiny, it's embossed, so it gives you the illusion that it’s some sort of fabric material versus a shiny glossy vinyl,” Stefanie Vanderbeck explains. 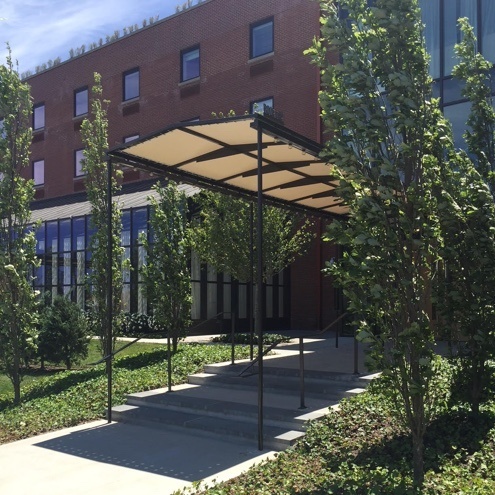 Hudson Awning created four large canopies for The Asbury Hotel using Coastline Plus fabric. The canopies have retained their shape and color. In addition, Coastline Plus’s Rain Kleen® topcoat makes the fabric extremely easy-to-clean—which is very valuable, because Hudson Awning's service division cleans and maintains most of their clients' awnings after installation. Stefanie Vanderbeck, Vice President, Hudson Awning Company, Inc.